Maybe it’s understandable in the current economic climate a studio not wanting to take a risk, but there were enough good commercial reasons here for Paramount to feel that this wasn’t a risk at all, as well as some less commercial reasons. What do the following franchises have in common? American Pie, Harold and Kumar, Austin Powers and The Naked Gun? In each case, the most successful movie at the US and worldwide box office wasn’t the first movie. In Austin Powers’ case, the take was around four times that of the original. Each of these franchises are live action comedies, not targeted at a family audience. Now of course, for every Naked Gun there’s a Police Academy, but Anchorman should have had enough going for it to ease any such concerns. I know nothing at all in actuality about movie economics and profit making, but the beauty of blogging is that it doesn’t stop me speculating. Back in the 1920s, when all of the money made by movies was made in the cinema, it was said that a movie had to make two and a half times its budget in its theatrical run to turn a profit. Since then, the advent of videos and then DVD have changed the market drastically, and the majority of profits now come from DVD sales and rentals. Given that the original made $85 million in the US alone off a $26 million outlay. Now while the sequel would be likely to cost nearer $100 million, based on the higher profiles of the talent involved, the opportunity for some double-dipping with the DVD, such as releases alongside the original, would surely have helped to offset any cost concerns. And other Will Ferrell movies like Talladega Nights and The Other Guys aren’t cheap, but they’re still getting made. Without conducting extensive polling exercises or market research (which are out of my current resources, for I am a mere blogger), it would be good to know what the audience reaction would likely be to such a sequel. Well, here’s where internet sites such as the Internet Movie Database and Rotten Tomatoes come in. When the original was released, Paul Rudd was probably best known as Phoebe’s boyfriend in Friends and Steve Carell was one of those guys off The Daily Show. Since the original came out, Carell has made Little Miss Sunshine, The 40 Year Old Virgin, Get Smart, Date Night and The Office, and Rudd has also stepped up to bigger roles in the last couple of years, with Knocked Up, Role Models and I Love You, Man, and they’ll be reteaming this summer for Dinner For Schmucks. If you put a teaser trailer together with no footage, no Anchorman 2 title card but just the names of the lead actors, you would get bums on seats. Are we suggesting that if they thought it was an Anchorman sequel, it would be less appealing than that? Will Ferrell has made a career out of Shouty Man-Child (TM), but Ron Burgundy is undoubtedly the most rounded and nuanced (and arguably grown up) of these characters. Through Talladega Nights, Semi Pro, Step Brothers and Land of the Lost, there’s been a law of diminishing returns in action. The best way to turn this around would be to allow Ferrell to go back to the original, and best, character he’s created. I don’t need to paste in links here to news stories to remind you of the world we live in, and how serious it is at the moment. 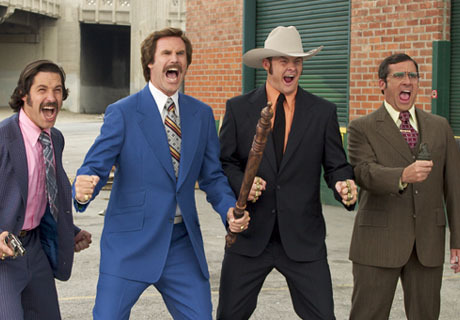 Anchorman was one of the best exponents of consistent quality silliness of the first decade of this century. Endlessly quotable, with surreal scenarios, it was also elevated by the touching love story with added competitiveness and swearing between Burgundy and Corningstone, but the defining quality was the undoubted bond between the four anchormen, and their constant battle to triumph over adversity. So please, Paramount, dig into your pockets and allow this to become a reality. Because the world needs more Burgundy. Did I mention I preferred Dodgeball? This entry was posted in Evangelism and tagged Anchorman, Carell, comedy, Ferrell, McKay, Rudd, tragedy.